Michael Kors announce the opening of its largest store in the world, located at 520 Broadway in New York’s SoHo, the store features multiple milestones for the luxury lifestyle brand: the debut of the men’s collection in the brand’s own retail stores; the first-ever in-store presentation of men’s shoes; an entire floor dedicated to accessories from Michael Kors Collection and MICHAEL Michael Kors, including watches, jewelry, eyewear and fragrance; and the largest selection of MICHAEL Michael Kors ready-to-wear and footwear in the world, with the first dedicated shoe salon in the US. A number of menswear products are exclusive to 520 Broadway and michaelkors.com. Distinctive design elements can be found throughout the three-story, 22,000-square-foot store, starting with a new men’s design concept that occupies the 4,000-square-foot lower level. The men’s shop features chevron flooring in gray oak bordered by white marble, black embossed leather wall coverings, custom-built, polished and blackened stainless steel fixtures with gray smoked mirrors and gray-marble display cases. Black-and-white photography, a Richard Serra painting and custom seating complete the effect. The ground floor is home to accessories from the brand’s Michael Kors Collection and MICHAEL Michael Kors labels, including handbags, small leather goods, watches, jewelry, beauty, fragrance and the new Luxottica-produced eyewear collection. Vintage Murano glass Sputnik chandeliers highlight the label’s jet set-chic aesthetic. Signature elements like sleek metal fixtures, mirrored surfaces and glossy, large-scale photographs evoke glamour and timeless sophistication. Huge, floor-to-ceiling video screens, set on all three floors, bring the products to life in a range of ways, from videos to fashion shows. The store’s second floor is designed to showcase the largest selection of MICHAEL Michael Kors ready-to-wear and footwear, complete with a spacious shoe salon. The 520 Broadway shoe salon will be among the first retail locations to carry the Michael Kors Jet Set 6, a seasonally updated collection of six essential shoes for women on the go. The Michael Kors Jet Set 6 Collection includes Irving sneakers, Odessa high heels, Kristen kitten heels, metallic jelly sandals, Somerly wedges and Walton ankle boots, all in multiple colors. 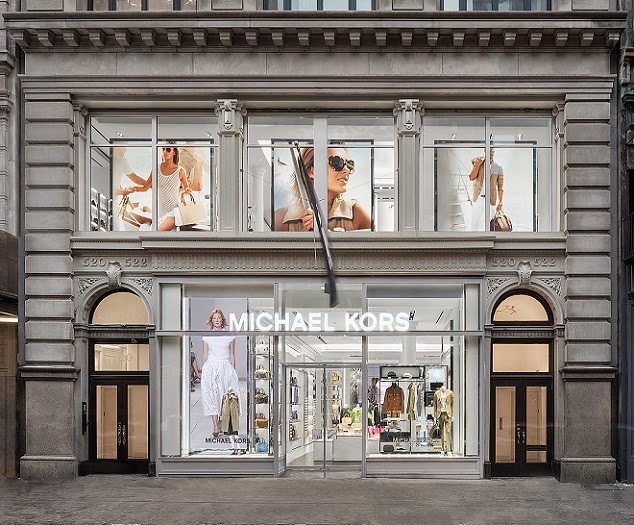 “I'm very excited to be opening our largest store in the world, and to have it be in SoHo,” says Michael Kors. “New York City is my home and the source of so much of my inspiration as a designer. It’s a thrill to be able to offer my customers here such an amazing shopping experience."